Pitt smashed its record for startups in Fiscal 2018, which concludes today. (Final numbers for the year will be reported next month.) One of the driving factors for the increase in startup activity is an evolution in policy at the university making it possible for faculty to take positions within a startup. Today we catch up with Globin Solutions, a recent startup formed from research from the lab of Dr. Mark Gladwin, led by Jason Rose, an assistant professor, who is the new company's CEO. From left are Charlie McTiernan, Jason Rose and Jesus Tejero inside the Gladwin Lab. In choosing Pitt School of Medicine for a postdoctoral fellowship in pulmonary and critical care medicine, Jason Rose’s focus was less on the E.R. than in becoming an entrepreneur. Now, thanks to a cultural and policy shift at the University, Rose, now assistant professor, has been able to license a technology that he has co-developed in the lab and serve as the CEO of a startup built on that technology while maintaining his research and clinical duties as assistant professor. During his fellowship Rose simultaneously pursued an MBA in biomedical entrepreneurship. 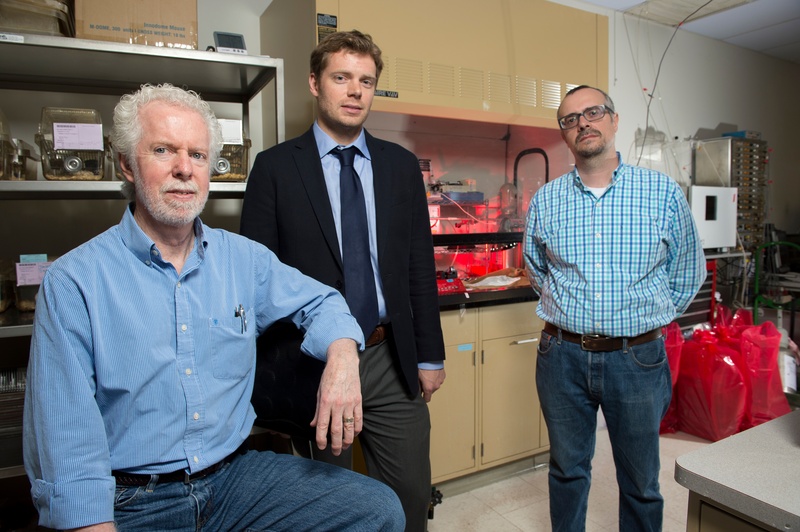 In the lab, he was working with Mark Gladwin, Chair of the Department of Medicine, and assistant professor Jesus Tejero, on a protein compound that is a scavenger of carbon monoxide (CO). The Gladwin lab had determined in mouse model of CO poisoning, that an engineered version of the compound was significantly better at unbinding CO molecules from blood hemoglobin than the current treatment in a hyperbaric oxygen chamber. Rose said about 50,000 people a year in the U.S. suffer acute CO poisoning, resulting in approximately 2,000 deaths. About 40 percent of those who survive suffer a serious impairment in neurological function. In addition to being an ineffective treatment, hyperbaric oxygen chambers are offered in about 250 centers across the nation, primarily in urban centers, making treatment difficult for those who must travel from more rural areas. The Gladwin team published a paper on the discovery of their CO poisoning antidote in late 2016 after filing an invention disclosure with the Innovation Institute. Rose said some outside interests had approached the Innovation Institute about licensing the discovery, but as he wrapped up his fellowship and his business degree, Rose identified this compound as a potential vehicle to put his entrepreneurial passion to work by licensing it himself. “We had this cool finding in the lab. It becomes a question of how do you bring an interesting basic science discovery to the point where it can help a person,” he said. Rose formed Globin Solutions Inc with Tejero as chief scientific officer and Gladwin serving as Chairman of the company’s board. In May the company raised a $5 million Series A funding led by Tus Science & Technology Service Group of China, and including UPMC Enterprises, the investment arm of UPMC. With the funding in hand, Rose’s focus now is on preparing for pharmacology studies on the compound and developing a manufacturing process. He is also seeking meetings with the Food and Drug Administration (FDA) to discuss the regulatory pathway the company will follow with the goal of eventually entering human clinical trials. Globin is among a record number of Pitt spinouts in Fiscal 2018. At least two others include investigators who have chosen to take roles within the new companies while maintaining their faculty positions. They include Eric Lagasse, associate professor of pathology, who has become chief scientific officer of LyGenesis, the spinout formed around his discovery for regenerating functional liver tissue inside lymph nodes, and Anne Germain, associate professor of psychiatry, who has formed iREST, a startup seeking to commercialize a sleep monitoring and improvement platform that she developed with Bambang Parmanto, professor of health information management at the School of Health and Rehabilitation Sciences. Asked how he manages his clinical and research duties while also leading a startup, Rose said it comes down to a commitment to get things done. “You have to aggressively pursue your goals, focus on the next task at hand and be efficient,” he said. While he realizes that as the company progresses from pre-clinical to clinical stages and beyond that he may face a choice of whether to pursue the startup full-time, Rose said he appreciates the flexibility in the company’s early stages to continue his life as both a physician-scientist and entrepreneur.